Fixed the weights for 11 models, that cache update has just been pushed live. Thanks @Diablo! Fixed a bug with the Event chest. Fixed a bug with the Crystal chest. Fixed a bug with the Mystery boxes. Fixed a bug with the ‘Prove Your Worth’ quest not allowing you to start the quest with the correct stats. Fixed low level Slayer, had it set to Green Dragons only by mistake. Fixed the level for the Attack Potions in the Herblore skill guide. Fixed the ‘Cheer at the Druids Circle’ clue scroll. Fixed the Special Attack bar for all the Godswords, plus the (or) versions. Fixed the Special Attack bar for the Sarasword and its Blessed version. Fixed the Special Attack bar for the Dragon 2H. Fixed Auto retaliate with the Scythe. Fixed the Scythes Attack interface, it will now properly show the weapon name, and the attack styles will now swap. Fixed a couple of bugs with the redeem system. Renamed a few items to make more sense. Added a client sided timer for Super Antifire & Antifire Potions. Visual timers will now draw behind the interfaces, instead of above them. Adjusted the option for Vote Tickets, it’ll now say ‘Redeem’. When redeeming a Vote Ticket, it will consume all of them not just one. Added Sand Crabs as a low level Slayer task. Added Crushing Hands and Screaming Banshees to the Medium Slayer tasks. Added Nechryaels, Nechryarchs, Greater Abyssal Demons and Cave Abominations to the high level Slayer. Added a new Slayer task level called ‘Super Low Level’, these tasks will be assigned to anyone who is level 3 Combat and picked a low level Slayer task. You can now right click>Teleport to task with your Slayer Gem. Adjusted the Slayer task current task announcement message. https://community.badkush.com/showthread.php?tid=329&pid=671#pid671 to find out more! Occult Necklace(or) will now equip into the Necklace slot. Finalized the Luckiest Cutlass, it should be ready for release now. Added all of the Ornament Kits to the Rare clue scroll reward table. Adjusted the Blood Money shop. Replaced all of the Penguin Sheep at Lumbridge with normal Sheep. Adjusted quite a few of the clue rewards. Added the Dragon 2H Special Attack. Chinchompas will now work like Barrage for multi combat areas. Buffed the Black Chincompa, it now has +110 Ranged bonus instead of +80. 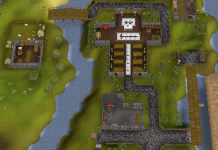 Replaced the Guards at Falador. Removed the duplicated Black Demons from Taverly dungeon. There were two different IDs for them. Nerfed Gurad Dog and added combat definitions for Wild Dogs. All Composite Bows now work. All of the Masks and Party Hats now have Prices. Added a Special Attack to the Magic Comp bow. Added the Willow, Yew and Magic Comp bow as Clue rewards. Previous articleNew Gear, More Combat and More!